I've waited for what feels like an age for a decent console fishing game since the arcade days of SEGA Bass Fishing on previous consoles. 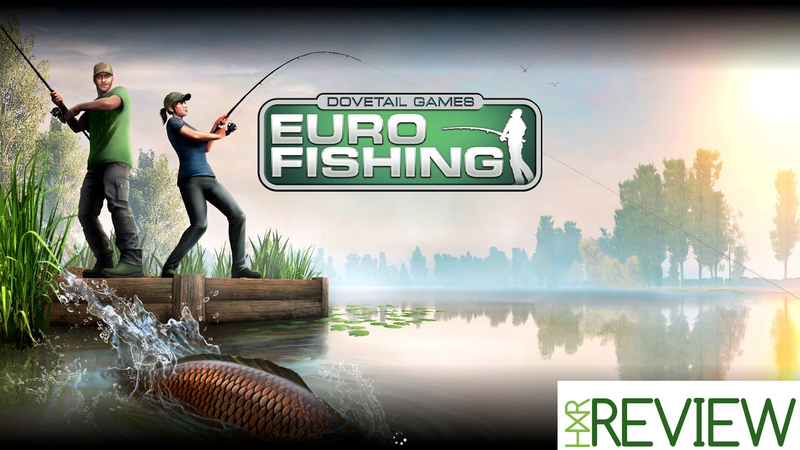 Euro Fishing was one of those games I by chance came across on the coming soon section of the Xbox Store a few months ago, but since then it's been a game I've been looking forward to getting my hands on. We saw a release date, only for that to be scrapped, but Dovetail came good on June 10th, when the game finally became available on the Xbox One. Now truth be told this review should have been out much quicker than this, but with a hectic home life and a review list the size of my arm right now, I'm slowly but surely getting to grips with the backlog I have on my hands. I feel bad though, as games like Euro Fishing need that review right around launch to make a proper impact in making gamers who are sitting on the fence about a game want to give it a look. This in turn sees some cash going back to the devs who have worked hard on bringing the game onto consoles. So if the guys at Dovetail read this review when I email it over, sorry for the short delay in getting this up. Fishing for me is a sport/hobby I have a soft spot for thanks to my Dad, who hopefully without lowering the mood in this review passed away when I was 19. My Dad used to take me and my two brothers fishing every now and then before he passed away, so it's something I look back on in a very fond way. While he took me to these places every other weekend, sadly it never got to that point where I could do all the setting up of all the bits and pieces by myself, so when he passed and my older brothers did their own thing I found myself having something I had started to fall in love with becoming something I could never just jump back into by myself. For the last few years or so I've found myself really wanting to go fishing again, but always put it to the side for this very reason. Enter Euro Fishing, which turns out is not only great fun but it's also helped an old man get his novice fishing on without all the hassle of having to know everything. So what does Euro Fishing offer you for the £14.99 asking price and is a simple fishing game worth your time? Read on to find out. Now sure Euro Fishing does not come anywhere close to the real hobby of going out on a quiet bank with fellow fishermen, eating soggy sandwiches on a cold Sunday morning, as it lashes down with rain, I know that. What it is though is a great compromise for those who want to enjoy this relaxing hobby but lack the knowledge of all that is needed to do it in real life. Before we talk about the modes on offer in the game via both the offline and online modes that it has, I will do what I always tend to do in these reviews and that's get the negatives out the way first. So starting right at the very start of the game I better talk a little about the character customisation the game has, well more the lack of. Loading up the game for the first time you are met with the character creation screen for the character you will be seeing a lot of in the game if you're using the third-person view that the game has. At first viewing, It looks at lot when you see eight male characters and four female characters to choose from. When you look closer you see it's actually only four male characters and two female characters to pick from, with the others just being the same character wearing a different shirt. It's not like you can change anything on the character either, so the face and hair colour you have you're basically just stuck with it. It would have been nice to toggle eye colours, weight, height and so on, but while it's missing all that it doesn't tarnish the game bad enough to instantly throw hate at it, it just would have been nice to have a few more options available to you. Away from that a few glitches here and there when it comes down to fishing, I don't really have a bad word to say about what Euro Fishing has to offer at all. So before I go fully into why I liked the game, let's talk about what modes and things you can enjoy for parting with your cash. Academy: In this mode you're taught the ropes on everything the game has to offer. You start with the basics like learning how to move around, changing your view, and of course casting your rod by using the advanced right analog stick method, or the noob fool proof method of a power bar by pressing RT. After that you're taught more advanced things, and under ten minutes you're fully up to speed with everything you need to know to enjoy the game for yourself. 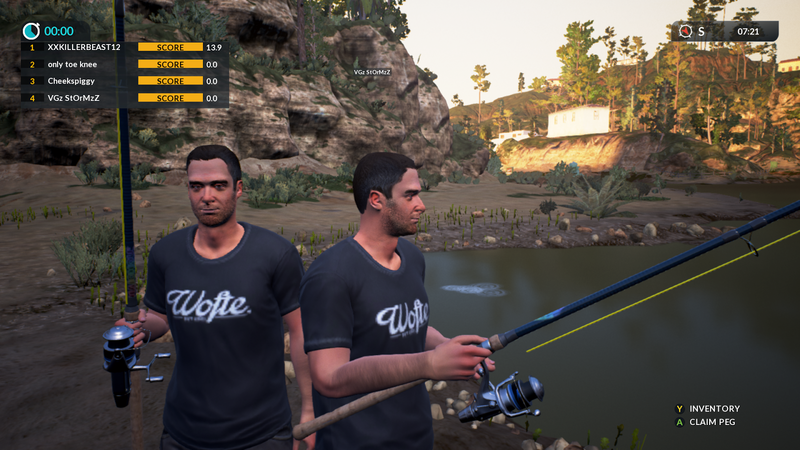 Challenges: Four modes can be found here that attempt to mix things up a little and bring a little more fun to the game away from the serious side of fishing. If you've played mini-games in other sports games such as PGA Golf then you know what to expect when coming into this. The four modes on offer are score attack, time attack, time trial, and distance challenge. Now being honest, all four of these are modes are ones you will perhaps try one or two times if you're not a leaderboard guy, as the true excitement comes when playing the game to catch fish. These modes do an okay job of taking you away from just fish, fish, and more fish, but were very much for me a mode I took a quick look at only to never pay that much attention to afterwards. Tournaments: Here you can play offline timed tournaments against AI anglers, which in return will net you XP points that will see you rank up your character, but way more importantly get you tackle points which you can buy new gear with (will get to this shortly). 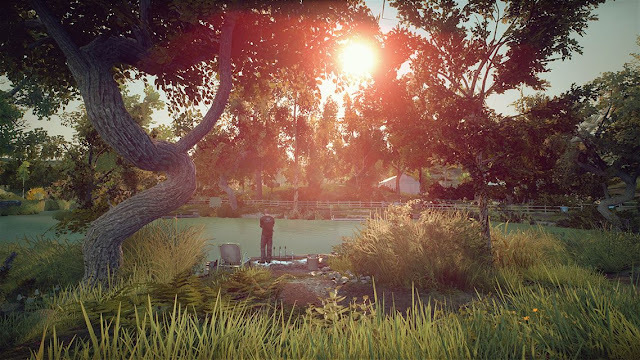 Freedom Fishing: This is simply the mode you will find yourself sinking a ton of time into. Pick a lake, choose your gear, mess with the settings and go out there as fish as much as you like. Fishing from the bank with just the one rod, or claim a peg to cast with three rods all equipped with alarms for a more frantic fast paced time at the lake. A word of warning, be sure to prepare your online friends for images like the one below being spammed into your feed, as you will find yourself taking pictures of any half decent fish that you catch acting like you've just caught the Loch Ness. Live Tournaments: Now while these aren't online as such, they do at least offer the chance of you playing against the scores of others players via the leaderboards. Tournaments tend to either be about final weight or how many fish you've caught in the time available to you, but you also tend to get three attempts at scoring well enough to claim a decent tackle point award when the tournament ends. Online: This is simply where you go to play with friends, sadly having no friends who play the game I've found myself playing with random people who've picked up the game. Still good fun though, as when entering a game a nice leaderboard is on the left side of the screen to see who had caught the most weight in fish, so it takes the fun of freedom fishing and adds in others. Like I said in the video I did on the game recently, it's rare that small games like this even have an online portion to them, and yes while it is a bit laggy at times, it's not that bad to ruin the fun the game has to offer. We won't go into how much of a let down it is seeing your twin as you look to claim a peg when playing online though. Sort out some more things to make myself look different Dovetail please. Tackle Box: The final thing to talk about in this review is something I touched upon earlier, that being the tackle box. Here you can go to spend your hard earned tackle points, which you receive by ranking up, winning tournaments, and just having fun and catching some fish. Here you can buy new rods, reels, hooks, and food, which will hopefully help you net one of the massive boss fishes on one of the five fishing spots available. 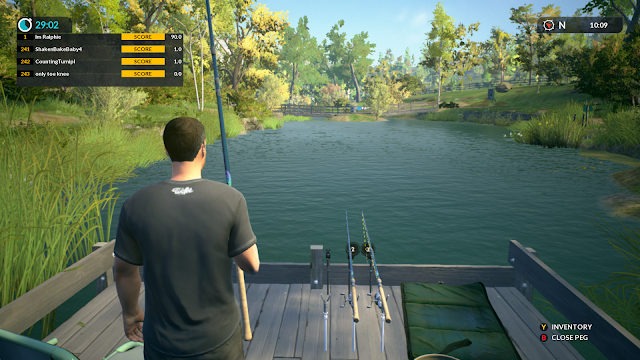 Overall: Dovetail Games Euro Fishing is the only fishing game (forgetting the BC version of SEGA Bass Fishing) on the Xbox One right now, so it's a good job I love it. 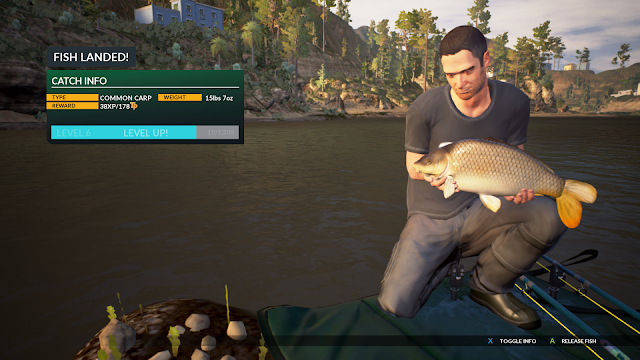 You know a game has you hooked (pardon the pun) when you're wearing a headset while cooking lunch, listening for the sound of a bite alarm to go off in them so you can run into the other room like a crazed lunatic to catch whatever fish has taken to your bait. You got me good Dovetail, now just tweak a few things with customisation and you have a damn fine game on your hands. Nice review! Really like how you personalized it, bringing memories of your dad. Hi, thanks for checking out the review. You start out with zero obviously, but by catching fish your score goes up with what weight the fish are that you catch. Have the most weight by the time the clock runs out and you win.